DILUTING LABCOLOR: You’ll need to premix your LabColors in order to use them in this project. We like diluting the small bottle of LabColor in 4 oz. of distilled water. For more on diluting LabColors, check out this blog post. ONE: Melt the coconut oil in the heat resistant plastic pouch and pour it into a heat-safe container. TWO: Add the shea butter and stir well. If the warm coconut oil doesn’t melt the shea butter fully, put the container into the microwave on 10-second bursts. This ensures that the shea butter doesn’t get too hot, which can cause graininess. 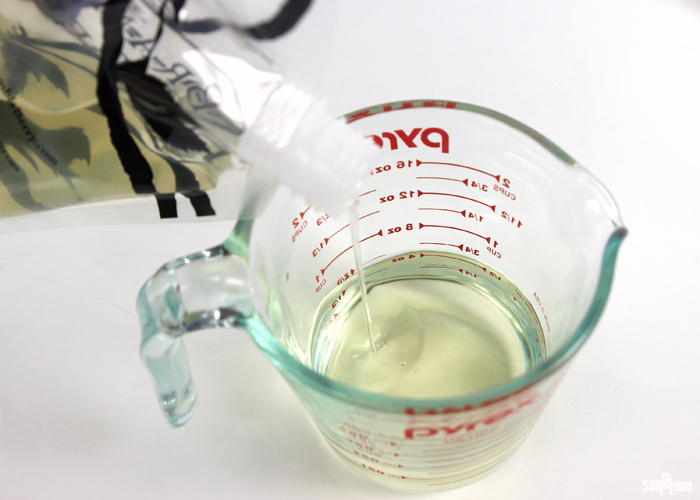 THREE: Add 8 mL of the Crisp Cotton Fragrance Oil and stir well. FOUR: Check the temperature of the oil mixture. If it’s below 176 °F, add 3.5 mL of Optiphen. If your scrub is warmer than 176° F, the preservative may not be effective. FIVE: In a separate container, measure out the Fine Grained Dead Sea Salt. 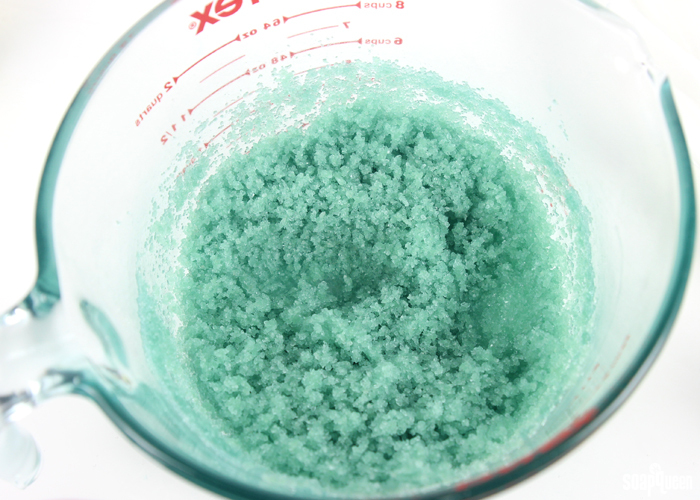 Add 12 mL of diluted Blue Mix LabColor and 5 mL of diluted Emerald Mix LabColor. It may be difficult to mix in the LabColor at first. We found the best strategy was to put gloves on and hand mix the colorant into the salts. It’s very important to mix the LabColor into the salt first because the water-based LabColors will not mix into the oil-based scrub otherwise. SIX: Add 2 1/4 tsp. of the Gold (light) Mica and mix well. SEVEN: Pour the oil mixture into the salt and stir well. Be sure the salts are completely enveloped in oil and no salt chunks are present. EIGHT: Once the scrub is fully incorporated, pour into two 8 oz. Glass Bail Jar. Let it fully cool and it’s ready to use and enjoy! If using in the shower, be careful! The oils will make the bottom of the tub very slippery. What is your favorite way to prep skin for the warmer months? 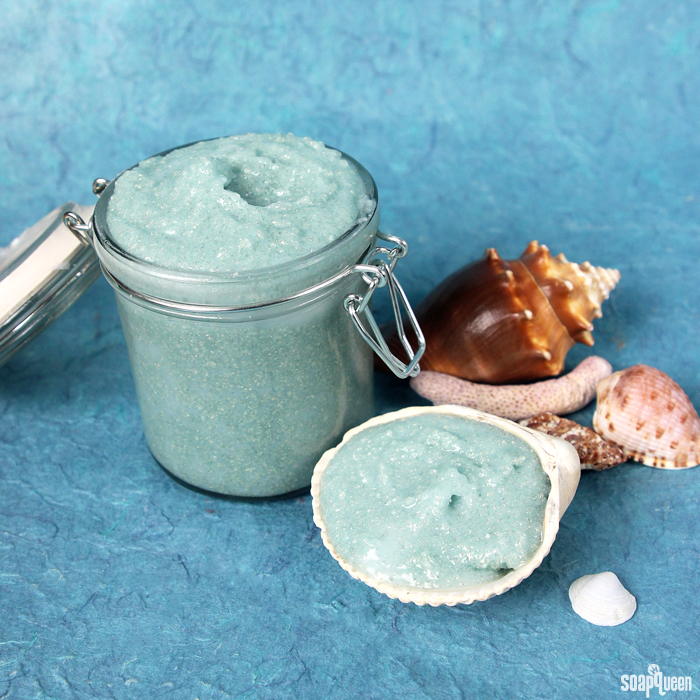 This ultra moisturizing scrub has a fresh clean scent and a bit of sparkle. DILUTING LABCOLOR: You’ll need to premix your LabColors in order to use them in this project. We like diluting the small bottle of LabColor in 4 oz. of distilled water. Melt the coconut oil in the heat resistant plastic pouch and pour it into a heat-safe container. Add the shea butter and stir well. If the warm coconut oil doesn't melt the shea butter fully, put the container into the microwave on 10-second bursts. This ensures that the shea butter doesn't get too hot, which can cause graininess. Add 8 mL of the Crisp Cotton Fragrance Oil and stir well. Check the temperature of the oil mixture. If it's below 176F, add 3.5 mL of Optiphen. If your scrub is warmer than 176 F, the preservative may not be effective. Note: Although this scrub doesn’t contain water, it will likely get water splashed in it during use. The extra water may cause bacteria and mold to grow. We added a preservative to be extra careful. In a separate container, measure out the Fine Grained Dead Sea Salt. Add 12 mL of diluted Blue Mix LabColor and 5 mL of diluted Emerald Mix LabColor. It may be difficult to mix in the LabColor at first. 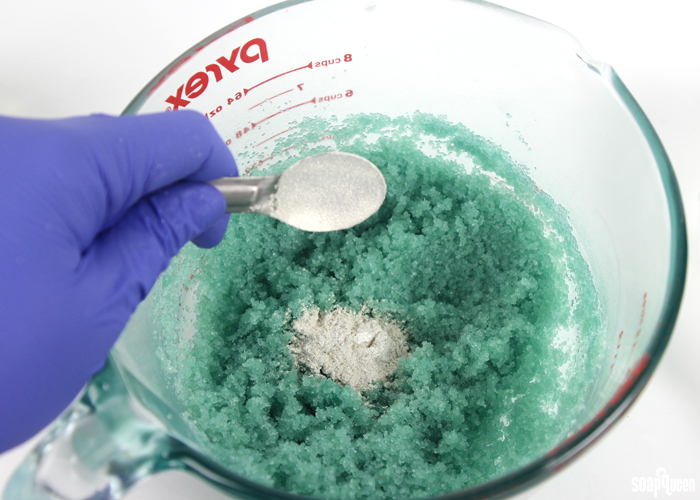 We found the best strategy was to put gloves on and hand mix the colorant into the salts. 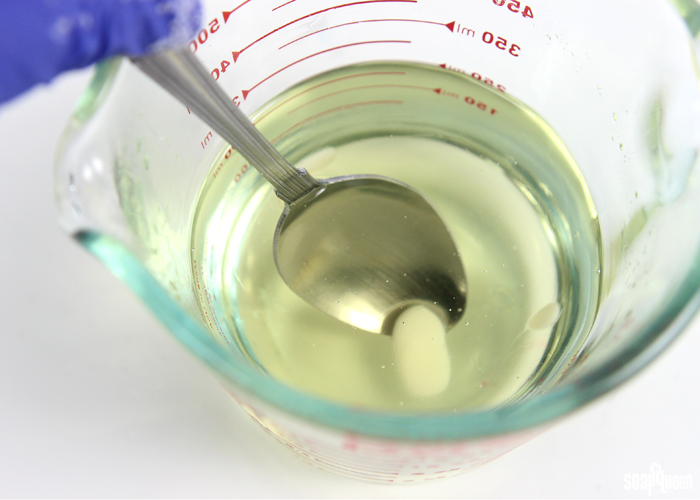 It’s very important to mix the LabColor into the salt first because the water-based LabColors will not mix into the oil-based scrub otherwise. Add 2¼ tsp. of the Gold (light) Mica and mix well. Pour the oil mixture into the salt and stir well. Be sure the salts are completely enveloped in oil and no salt chunks are present. 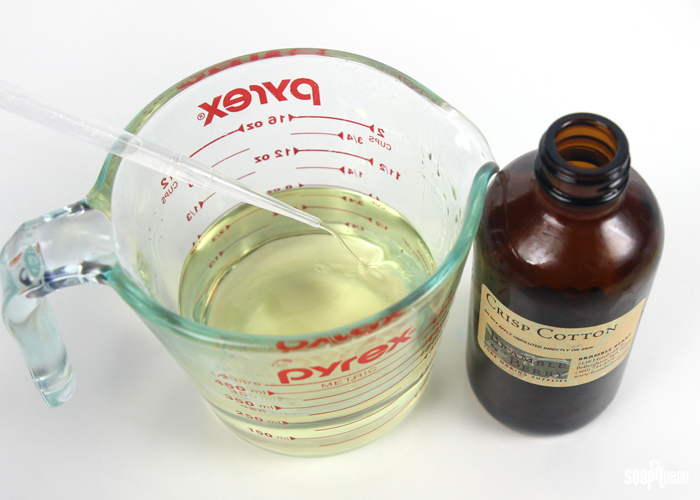 Once the scrub is fully incorporated, pour into two 8 oz. Glass Bail Jar. Let it fully cool and it's ready to use and enjoy! 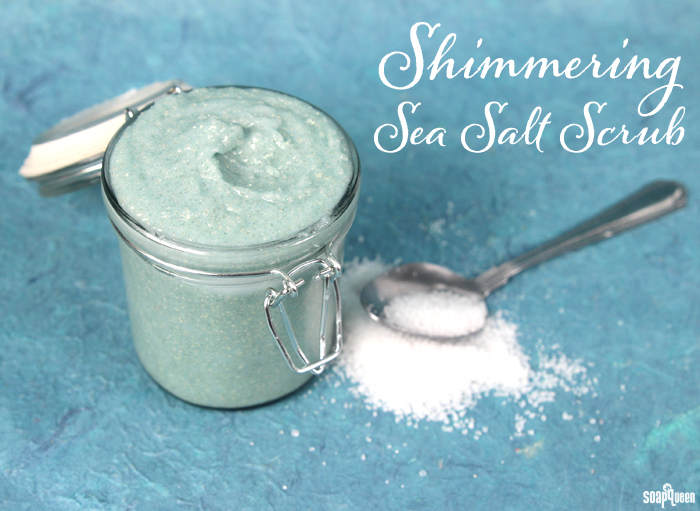 I have been wanting to make a sea salt scrub as party favors for my island themed bridal shower coming up in a couple weeks…after finding your recipe and reading the reviews I think this is the best choice! Just a couple questions, I saw a few comments about how this scrub tends to leave an oily feel on their skin as well as how the salt dissolves quickly leaving the “scrub” not very scrub-like and more of an oil-rub. I was wanting to make more of scrub-like “scrub” and less of an liquid/oil based “scrub”. 2) How can I increase the recipe in order to fill 20 4oz jars? Do you need an emulsifier? I am wondering if the potassium cocoate and oils will separate? Is the preservative absolutely necessary or just recommended? Also, is there anything that would be a suitable replacement for the shea butter? Also, mango butter is a good substitute for shea butter! They do have a similar texture, with mango butter being slightly more firm. You can also add cocoa butter, which is more firm than shea and mango. It will give the scrub a slightly different consistency, but should still feel really nice! Would using 8 mL of peppermint essential oil rather than fragrance oil be too much peppermint and cause a strong reaction or icy-hot feel? I wouldn’t mind having a slight cooling effect I just don’t want it to be too strong. 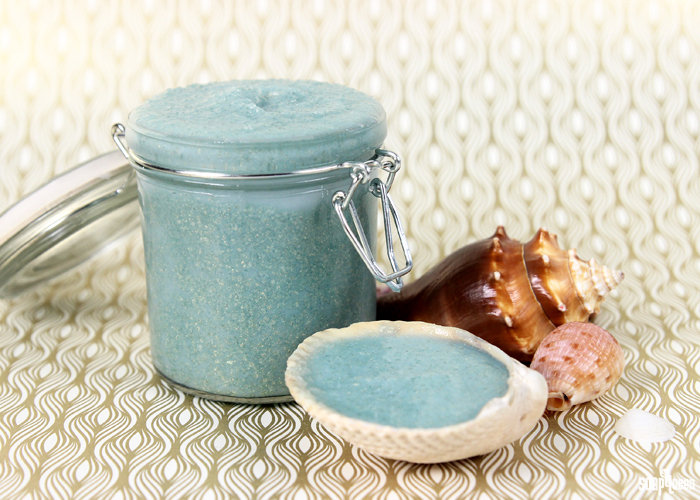 Because this scrub contains oils like coconut and shea butter, it will feel a bit more oily. Those oils do help moisturize the skin though! could i use mica or ultramarine to create color for this scrub? Ultramarines (pigments) may be a bit more tricky. They are heavier, so they may cause streaking on your skin. I would recommend making a small test batch with the pigments to see what you think! Can you substitute sugar for the salt in this recipe? 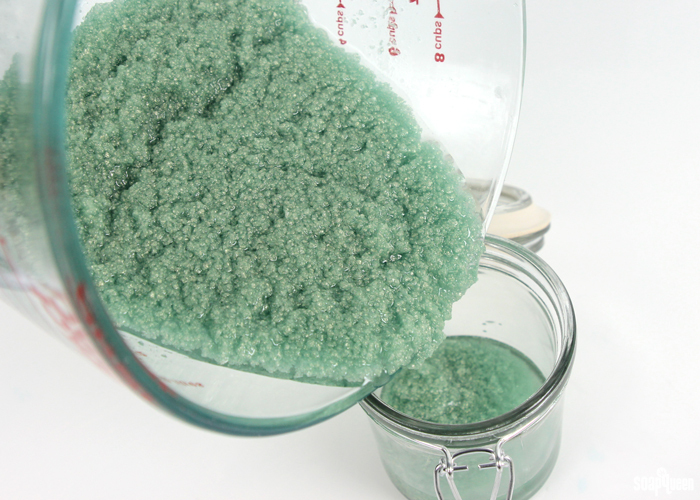 This is my favorite sugar scrub recipe! I wanted to change up the scent for the fall and mixed pumpkin souffle and clove bud. After further reading, I am little nervous about the clove bud. I used 4 ml of the pumpkin souffle and .5 ml of clove bud. Is this a safe amount for this particular recipe? Also, I think your recipe should be just fine. Clove Leaf Essential Oil can cause irritation if too much is used. However, our Fragrance Calculator suggests up to 10 mL for a strong scent, and your usage rate is way under that. Because of that it shouldn’t cause any irritation! Hi, I’m curious the shelf life of this scrub. I’m looking to make it for holiday gifts and I’d like to start working on some of my projects (lotions, soaps and scrubs) now prior to when the holiday season gets busy. My biggest concern is what will happen to the product if I make it now and then put it on the shelf in storage for the next three months? I was wondering for all of your scrub/bath salt recipes, do you weigh out the ingredients? I am so used to weighing everything for soap so I thought I would ask! I can’t wait to try some of these great recipes! I made this recently and I love the smell and color, however I have noticed two things: 1) when I use the scrub it leaves my hands very oily and almost slimy and 2) the salt dissolves almost immediately when I put it into my hands. Is there anything I can do to fix either of these? 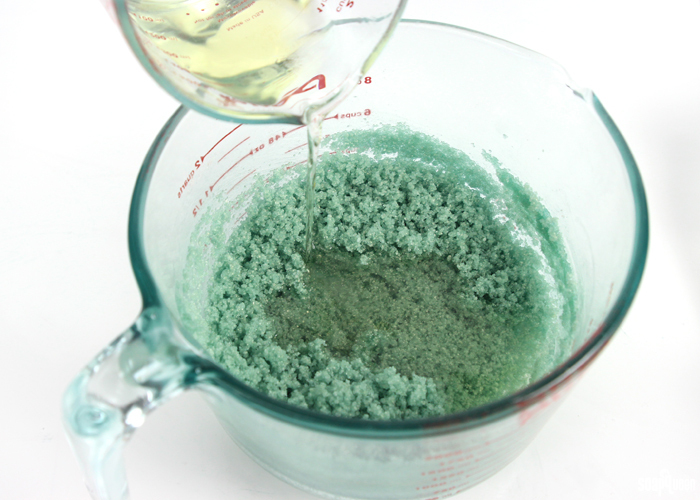 Because this scrub is oil based, it can feel oily on the skin. The great news is those oils help moisturize your hands! Can I use fractionated coconut oil instead? Is it possible to use cocoa butter instead of shea butter in this recipe, or even just half of each? 🙂 I have both, but way more cocoa butter than shea. Can I use Phenonip in place of the Optiphen? If so, what amount should I use? What is the recommended way to use this sea salt mixture? Thank you I found the information! Love this, the color is fab! Just wondering will the gold mica rinse off or stick to your skin because of the oils?? I will be making this for personal use, and this will be my first attempt at making a salt scrub/soap related item. Is it important to use the color or is the color used simply for aesthetic purposes. Love the colors! I’ve been wondering what causes graininess in my lotion bars. I use cocoa butter and mango butter in them, and they only become grainy if they were made a few months before they were purchased. Could this be temperature related? Do you have a good resource for this information? If cocoa and mango butter get too hot too quickly, they can get grainy. To prevent this, heat your oils and waxes and then remove them from the heat. Then, mix in the cocoa and mango butter. That allows them to heat gently.